Editor’s note: I’ll be out of the country this January in Myanmar and will resume showcasing new photographers on February 2, 2015. Hard to believe that Verve Photo has featured close to 1,000 photographers from over 80 countries during the past seven years. Happy New Year to all of you out there! 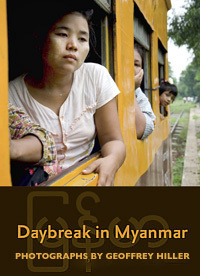 These images are from my new book Daybreak in Myanmar. I’ve returned to Burma several times since my first trip in 1987. The country was frozen in time until a few years ago when the government announced a democratic opening. Most of the visible economic and social changes have occurred in Yangon, but in the villages change is slower. On-going trouble in the border areas with ethnic minorities (including the Rohingya) continues to flare. The Burmese people know that there is still a lot of political uncertainty going forward. The book is 192 pages with 170 color photographs printed on 157 gsm matte art paper. Trim size is 18.5 x 25.5 cm. It’s sequenced by time of day showing Burmese daily rhythms and includes six short interviews with leading Burmese writers and activists by UK journalist Francis Wade. Order a copy of the book here $29.95 + shipping. Thanks for supporting this project. By doing so you are supporting documentary photography and all of the work that has gone into creating Verve Photo. Vincent Catala (b. 1975, France) lives and works between Europe and Brazil. In 2000 he graduated from McGill University with a Masters Degree in Intellectual Property. He became a photographer in 2006 after having various jobs. Vincent often photographs for urban planning and architecture clients. He also does portraits for music labels and the press. Since 2012 he has been involved in a personal research focusing on the evolution of the city of Rio de Janeiro. His work has been the subject of various exhibitions in Paris, Amman, Los Angeles, Rio de Janeiro, Tbilisi, Braga and was awarded several prizes and has been published in Le Monde, Télérama and The Sunday Times Magazine. He is represented by Agence VU. Elena Chernyshova (b.1981 USSR) is a self-taught photographer who after two years of work as an architect left her job and bicycled from Toulouse to Vladivostok and back again: 30,000 kilometers, 26 countries and 1,004 days. The trip led her to decide to become a photographer. In 2011 she received a grant from the Lagardère Foundation to create the photo documentary ‘Days of Night – Nights of Day’ about the daily life of the industrial city of Norilsk, located 400 kilometers north of the polar circle, in Siberia. Elena’s work has been published in National Geographic, Le Monde, Internazionale, Days Japan, A/R magazine, Newsweek Russia, and Ecology and Life. Her awards include: World Press Photo 2014; Days Japan Awards and others. Pierfrancesco Celada (b.1979, Italy) has a PhD in Bio Mechanics but is currently working as a freelance photographer. In 2011 he interned at Magnum Photo and won the Ideastap and Magnum Photographic Award for his project Japan, I wish I knew your name, his current book project. Pierfrancesco’s work has been exhibited internationally and published in Newsweek, Times Lightbox, Amica, D-LaRepubblica. He is currently working on the second chapter of Modern Megalopolis: People Mountain People Sea about life in Chinese Mega-cities.